New York, The founder of Facebook, Mark Zickerberg earned the profit of 3 billion and 40 crore dollars within one minutes and he became the fifth richest person around the globe. The American magazine, Forbes, issued the list of the billionaire personalities around the world. According to this magazine, mark Zickerberg earned the profit of average 5 crore 66 lac and 66 thousands and 700 dollars per minute within one hour according to the local time and after this recent profit, he reached at the fifth position after promoting from the sixth position. Now total worth of his assets became 56 billion and 70 crores. 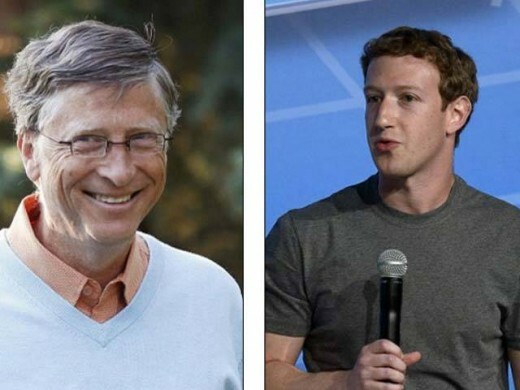 In the list of the most wealthier person of the world, Bill Gates, owner of Microsoft is leading in this race and the total worth of his assets is 77 billion and 70 crore dollars. In the list of richest people, the second position is held by the Spanish fame American, Amancio Ortega, who is the owner of the leading fashion brand, ZARA. He has total wealth of 72 billion and 70 crore dollars. The Lebanese fame Mexican citizen, Carlos Saleem is at the seventh position and the total value of his assets is 50 billion and 30 crores dollars.